It's no secret that the healthcare industry lags others in adopting advanced technology. In an age where people can deposit checks electronically with smartphones, hospitals still have to conduct the HCAHPS survey by mail, telephone or interactive voice recognition. Since the survey is administered to patients between 48 hours and six weeks post-discharge, hospitals have a long wait before they receive and can act on patients' feedback — that is, feedback from the small percentage of patients who take the time to fill out the survey. This delay presents a less-than-ideal situation since HCAHPS scores affect reimbursement through CMS' Value-Based Purchasing Program and indicate patients' intent to return to the facility. The Mount Sinai Medical Center's Derald H. Ruttenberg Treatment Center in New York City decided to speed the turnaround process by offering an app that allows patients to securely complete a satisfaction survey online shortly after leaving the facility, providing nearly real-time, actionable information about their experience. After their visit, patients receive a text message with a link to a brief, 12-question survey using a five-star rating system. The patient satisfaction app, RateMyHospital, went live July 15. Randall F. Holcombe, MD, medical director of the Ruttenberg Treatment Center, estimates a 10-fold increase in the number of returned patient satisfaction surveys so far. The shorter gap between a patient's visit and the return of his or her survey means the cancer center can make changes more quickly, maximizing the number of patients who can benefit from a previous patient's comment. "We have more of an opportunity to effect any changes that might be necessary as opposed to waiting for all the survey results to be collated," Dr. Holcombe says. "It'll provide us with a lot more information which we can then utilize to improve services." The survey addresses scheduling, wait times, cleanliness and other factors. As certain areas of patient experience improve, the cancer center can change its survey questions to focus on other issues, according to Dr. Holcombe. "The advantage is we can tailor the questions to really focus on areas where we need to get patient information to improve the overall patient experience," he says. "Six months from now, we may need to have slightly different questions." One disadvantage, Dr. Holcombe notes, is that the center's unique survey precludes benchmarking against other institutions. However, the center still administers the standard paper-based outpatient satisfaction survey through Press Ganey, which enables benchmarking. In addition to the traditional survey and the app, the Ruttenberg Treatment Center solicits patient feedback through focus groups, a patient advocacy group that launched about a month ago and physician surveys. 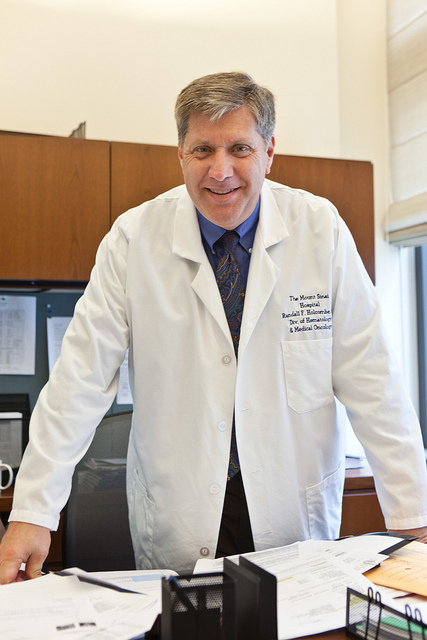 "Through all these different mechanisms, we get lots of feedback so we can try to identify what issues are most important to [patients] and try to make sure things function as smoothly as possible for them," Dr. Holcombe says. The focus groups include around 10 to 12 patients that meet at least monthly to discuss their experience. These groups help the center's leaders identify patients' needs and may guide future survey questions. For example, comments in one focus group revealed that many patients were unaware of the facility's patient resource center, which includes books, computers and other tools. The patients in the focus group asked the leaders to place large signs directing patients to the resource center. "That's not something we would have asked a survey question about, because we didn't know people didn't know about it," Dr. Holcombe says. "We will do follow-up questioning in our subsequent focus groups to see whether the changes have been effective." The patient satisfaction app thus supports the center's overall efforts to improve the patient experience. Mount Sinai plans to expand the app to other clinical areas in the future.